The vast wilderness of Montana is both beautiful and daunting at the same time. You can drive for miles and miles and not see any towns, only pristine nature, hence its nickname as the Big Sky Country. It is most famous for its beautiful and expansive national state parks such as Yellowstone and Glacier National Park. The vastness of the land lends itself to an economy comprised mostly of agriculture. However, given the major national parks in the state, tourism is quickly becoming the biggest source of revenue for the state. If you love the great outdoors, then you’ll have several cities to reside in that are both beautiful and safe. Due to Montana being so large, its population density is a low seven people per square mile. This disqualifies most of the cities within the state to rank amongst the safest cities in the nation. However, the 3 bigger cities of the state did make it onto the top 750 safest cities in the country. 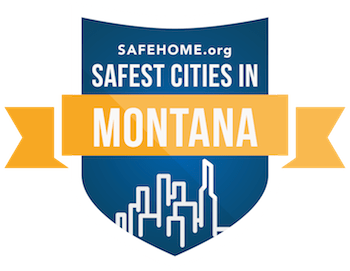 Within the state, the 25 safest cities range from an impressively high safety score of 95.9, down to 57.08. Twenty of those cities have safety rankings above 70, which is very good. The safest city in the state is Dillon, with a safety score of 95.9 and a small population of 4,244. It began as a railroad town due to being close to gold mines. Over time its economy remained reliant on mining, but also grown to have a good tourism sector. Most of the residents here are self-sufficient and enjoy the outdoor life, which may contribute to its high safety ranking. People just mind their own business here, hence the 40.1% drop in already low property crimes. The safest cities within this state are spread out all over. Much further north, near the Canadian border, is the second safest town of Conrad. It has a safety ranking of 91.33 with a population of 2,604. Hundreds of miles to the east, closer to North Dakota border, is Glasgow, with a safety rating of 90.26. Bozeman is close to Yellowstone National Park, with a safety rating of 81.59. No matter where you may want to live in the state, you’re sure to have a safe city as an option. Top 5th Percentile in U.S.